Maguire had earlier escaped a red card after deliberately fouling Mane 40 yards from goal when the winger looked to sprint clear, while Liverpool were denied a second-half penalty when Naby Keita was fouled by Ricardo Pereira. Liverpool could have gone seven points clear with victory over a team that had lost their previous three league and cup games. However Leicester were threatening throughout and are only the second team to leave Anfield without suffering defeat in the league this season, following Pep Guardiola’s side on 7 October. Despite moving a further point ahead of Guardiola’s City, this result will be widely viewed as two points dropped. Except for their initial flurry, Klopp’s side were nervous, sluggish and far from their free-flowing best on an icy surface – yet they remain in a strong position with 14 games remaining as they chase a first league title since 1990. Liverpool had won seven top-flight games in a row at Anfield and expectant home fans chanted the name of their former manager Rafael Benitez, who masterminded Newcastle’s win over City, after Senegal winger Mane struck after cutting inside and scoring with a low, skidding shot. 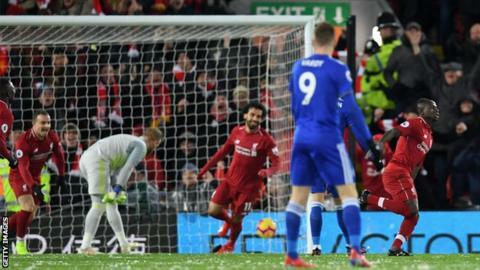 Brazil striker Roberto Firmino was then denied by a fine save from Kasper Schmeichel but the Foxes grew into a game that turned out to be anything but straightforward for the leaders. Alisson, who gifted Leicester a goal at the King Power Stadium on 1 September, made two mistakes in the first half, with the second error leading to a golden chance for James Maddison, who headed wide. Netherlands defender Virgil van Dijk, who was ill in the build-up to the game, was also not at his imperious best and Leicester’s equaliser came when he failed to pick up England centre-back Maguire at the back post. Liverpool were frustrated when Martin Atkinson ignored claims for a penalty in the 58th minute after Pereira clipped Keita, but a draw was the correct outcome on a night when the Reds missed an opportunity to open up a significant advantage at the top. It has been a poor start to 2019 for Leicester after they followed their FA Cup exit at League Two Newport with defeats at home to Southampton and away at Wolves. But at Anfield they recovered from a disastrous start and were both threatening in attack and organised in defence, with Marc Albrighton causing problems at one end and Ben Chilwell keeping Mohamed Salah – the league’s leading scorer – quiet at the other. It has been suggested Puel, in charge of the Foxes since October 2017, is under pressure and Leicester’s recent results have not done the Frenchman any favours. But his players produced a gutsy performance that suggests they are fully behind their manager. It was a timely effort too, given it starts a run of tough fixtures that include games against Manchester United and Tottenham. Leicester had lost on six of their past seven visits to Anfield yet might have been celebrating a famous victory had they taken their chances. At 1-0, Maddison headed wide from Albrighton’s cross before the same player horribly mis-hit another chance after Chilwell had got behind the Liverpool defence at 1-1. Alisson also made a save with his feet to stop Firmino scoring an own goal after Liverpool again failed to pick up Maguire from a set piece, while Demarai Gray shot at the keeper instead of passing to team-mates in a much better position. Liverpool’s lead could be down to two by the time they are next in action, away at West Ham on Monday (20:00 GMT). Leicester are back at the King Power on Sunday when Manchester United are the visitors (14:05 GMT).